This is an easy daytrip that can be accomplished with or without a car. 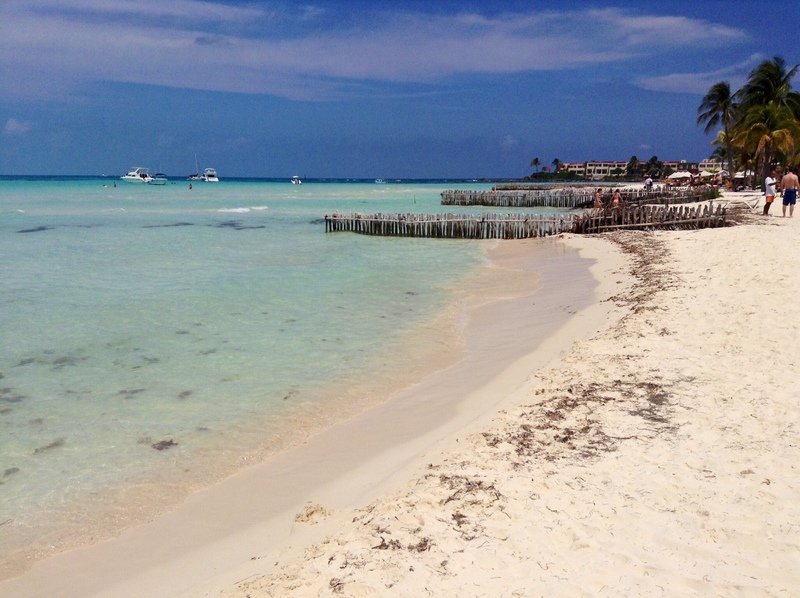 Isla Mujeres is a laid-back island off the coast of Cancun. It hosts a lot of tourists, so you will not have the island to yourself. 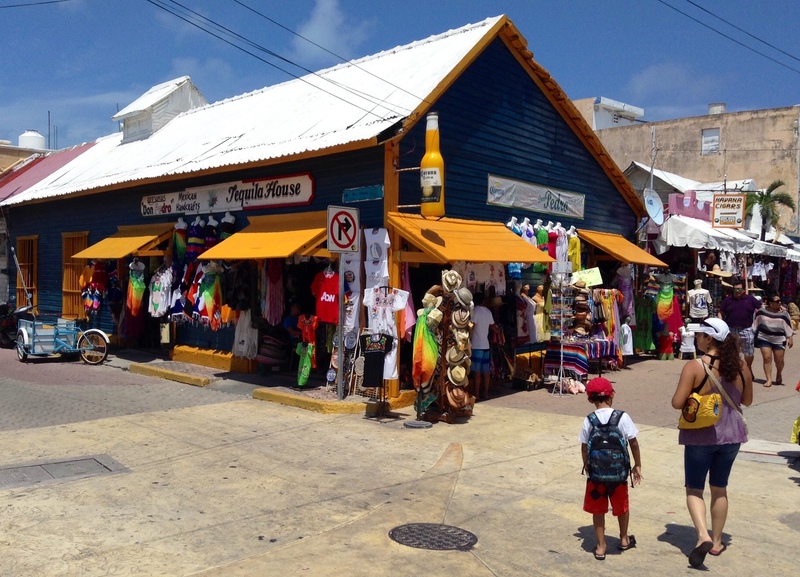 There is a “town” portion of the island with many shops and restaurants, the bulk of them on a pedestrian walkway called Hidalgo. It will remind you of 5th in Playa del Carmen. 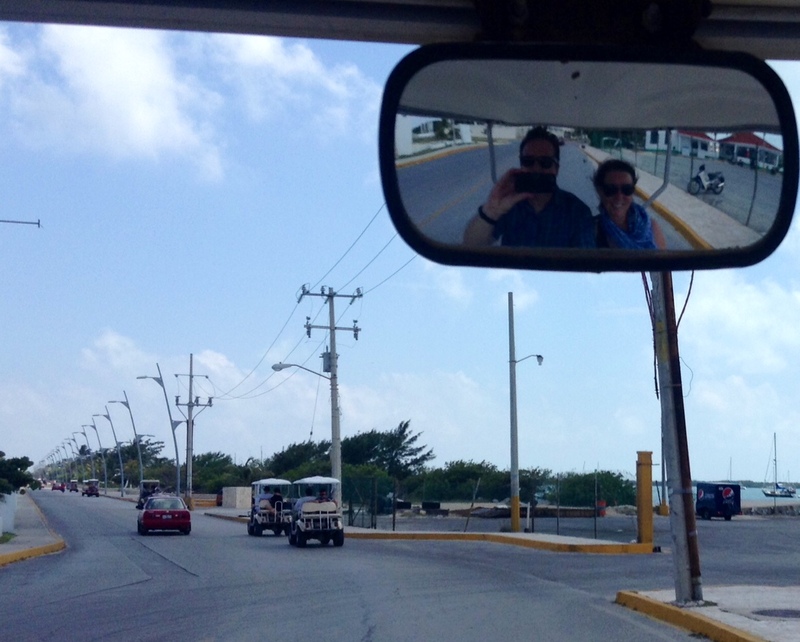 A fun thing to do is rent a golf cart and explore the whole island. I like visiting the turtle sanctuary, where turtles are bred and fed before they are released into the ocean. You will see a lot of turtles from tiny babies to very large adults. 30 pesos to get in. We like to wander around the town. Isla has wooden buildings, which are very rare on the mainland. There is also an opportunity to swim with dolphins or visit Garrafón Natural Reef Park which has good snorkeling and ziplines. An unusual attraction is Spiral Island/Joyxee Island, or plastic bottle island. Built by Richart “Reishee” Sowa, the island is made up of more than 100,000 plastic bottles. The island is an engineering marvel and features three beaches, a house, two ponds and a solar oven. You can tour the island for a donation of 50 pesos. 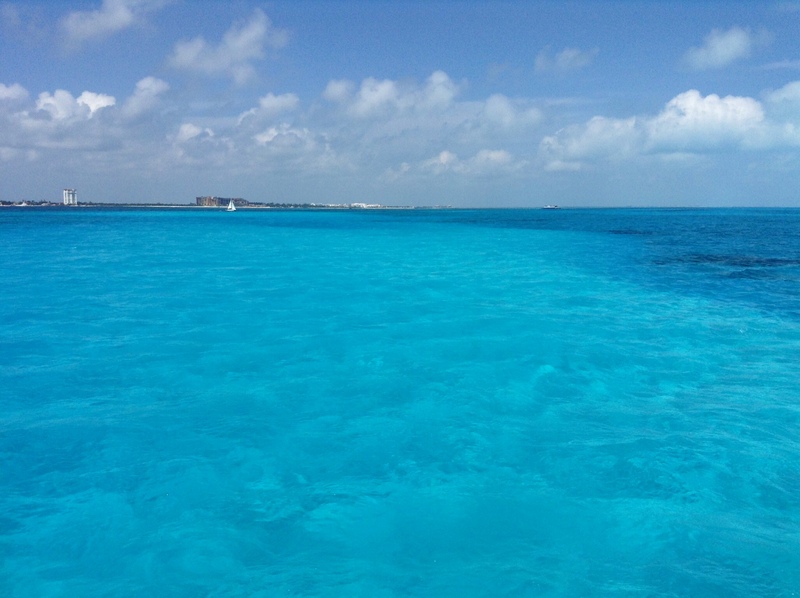 The ferry boat ride from Cancun to Isla offers some lovely views. The water colour is amazing! To reach the island you have a few choices. Catch the ferry at Puerto Juarez. The ferry is modern and fast and the trip takes less than half an hour. You can sit inside or outside on the ferry. Avoid the “rush hour” times for the easiest trip. Our method to get to Isla will take about 90 minutes or less. It sounds very complex, but it is usually a very easy trip. Our last trip in December, we waited almost no time at any of these steps. The collectivo at Puerto Morelos was waiting for us, we easily caught a cab to Juarez and we waited less than 10 minutes for a ferry. Arrive at Isla Mujeres. Walk through the terminal without stopping, you will be inundated with offers of tours, carts, cars and everything else you can imagine. Keep walking until you work out what you want to do, but get away from the gauntlet. Other options: You can take a taxi all the way from Puerto Morelos to Puerto Juarez for about 600 pesos. You can take a city bus from the bus station to Juarez, but it really doesn’t save that much money and will take a lot more time. Playa Norte, one the extreme north end of the island naturally, has the best beach. -UltraMar Ferries run every half hour from 5:00 am until 8:30 pm and then every hour from 9:30 pm to 12:00 am. Grab a schedule to ensure you don’t miss the boat. -Magaña Express also runs ferries at 10 minutes after the hour returning 40 minutes after the hour. They are slightly cheaper, but not worth it. -The UltraMar ferry has an open deck on the top and usually some musical entertainment. -If you are going to rent a golf cart and are planning to stay the day, rent your cart right away from one of the established cart rental companies, not from one of the dudes on the street. The day rate is around 500 pesos, from 9:00 – 5:00 pm. Hourly rates are around 180 pesos an hour. We always seem to end up renting from Prisma. Not the fastest carts, but good enough. They are on the main road and offer a coupon for 10% off on their website. Their prices are clearly marked inside. You will need to leave your driver’s licence to get the cart. -Playa Norte (North Beach) is a lovely beach. Keep working your way north to avoid the worst of the crowds. 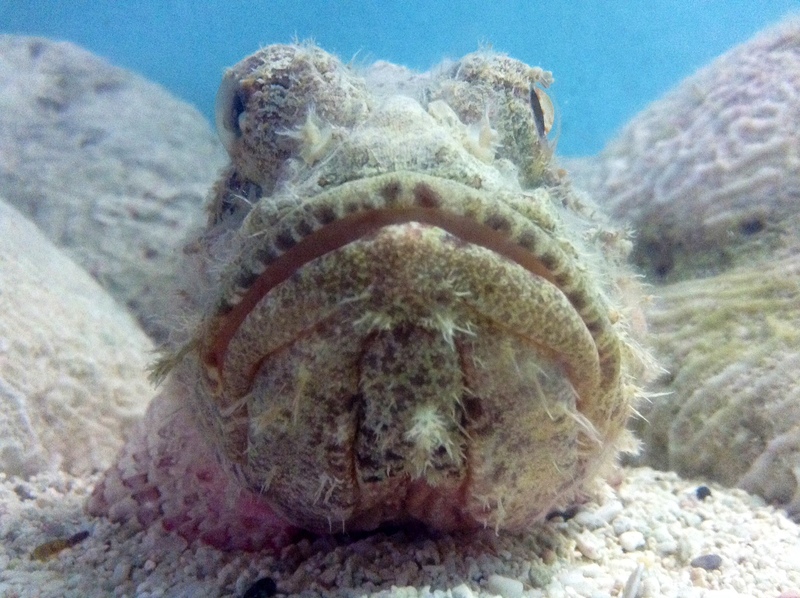 You will also see this guy at the turtle sanctuary. 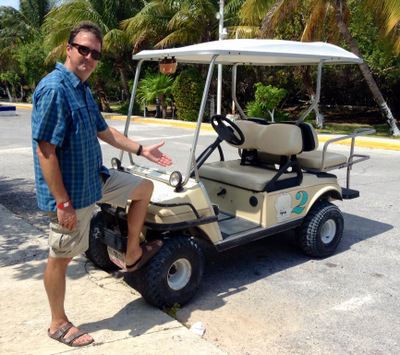 Renting a golf cart to explore the island is a good idea. Attempting selfies behind the wheel is less wise. The land at the south end of the island is much different.